Best views on the beach. 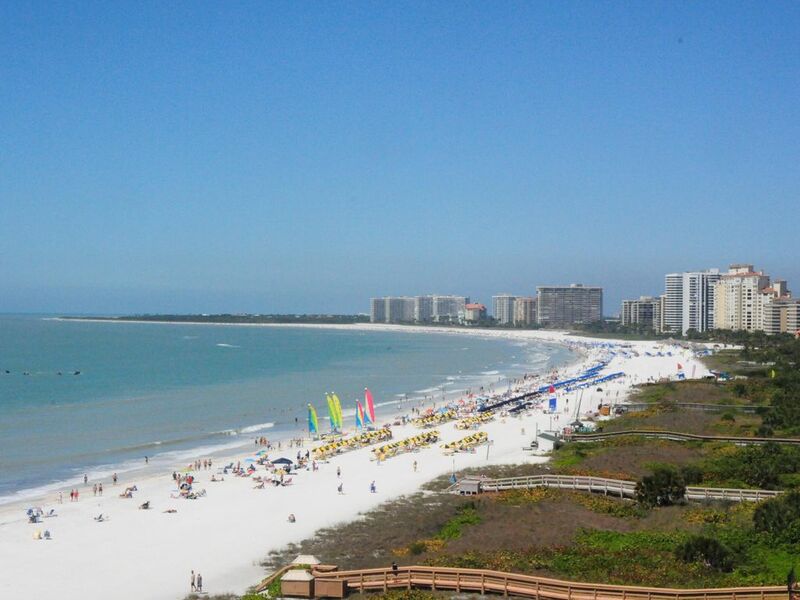 180 degree view of crescent beach from eight floor. Unobstructed view looking both south and north on the beach. Top notch building with two pools, tennis courts, pickle ball courts and an outdoor barbecue. Tennis Courts on Premises for Guests Pickle Ball Courts Installed. Flat screen 52'LCD HDTV with a Bose Lifestyle Surround Entertainment System complete with DVD player. Thermidor Oven/Microwave/and Warming Drawer. Side by side stainless steel refrigerator. Black ceramic four burner cook top stove. Washer and dryer with a laundry area for folding. Ceiling fans throughout the unit. All new coffee maker/toaster/dishwasher/calphalon cookware/stemware/dishes/towels/tel answering mach. Full functioning wet bar with refrigerator in the liaving area. King size bed in MBR with granite counter dressing area; flat screen LCD HDTV mounted on wall; double sink vanity; all glass walk in shower. Queen size bed in guest BR with adjoining TV room featuring LCD HDTV flat panel and a loveseat and ottoman. Two single beds with private bath and granite countertops in third BR. Full wall water fountain with water cascading down black slate rock. Free wireless internet. Unit was amazing. All kinds of amenities and a view second to none!! This condo is fabulous! It was immaculate and nicely decorated. The master bedroom has a great layout. The 2nd bedroom has a nice little alcove for extra private space. If you are not familiar with the Somerset, it is in a great location with convenient parking and the oceanfront views are spectacular. Harry was wonderful to work with. Highly recommend this condo! everything about condo was great. amazing views from big balcony. condo was very clean.would highly recomend. thanks for a great trip. Two well maintained tennis courts and two swimming pools are available for guests. Beautiful outside barbecue grill located near pool for outdoor cooking. Many first class golf courses in the local Naples/Marco area. Parasailing, jet skis, boat rentals, boat tours available on the beach. Movie theater withing walking distance from condo allows dinner while watching first run movie. the beach and walk to any one of four ocean front restaurants. distance of both the Marriott Resort and Hilton Beach Resort which have great shops and dining. Weekly Rate: $3000 - $4000 Monthly Rate: $9,000.00 to $15,000.00 $3,000.00 to $4,000.00 per week in season $2,500.00 per week out of season Monthly rates negotiable.